Most likely, you can recall a teacher, mentor, or family member who inspired you to pursue your current career. 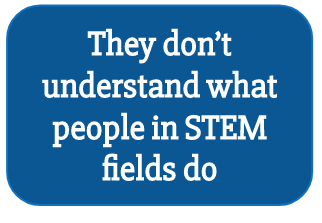 Many kids around central Indiana, especially those from underrepresented populations, don't have a connection with a STEM professional. Without that connection, kids don't understand what people in STEM fields work on and ultimately, they don't choose to pursue STEM careers. STEM Partners is bridging that gap by building partnerships between teachers and industry professionals and strengthening the presence of hands-on science curriculum in Indiana classrooms. We're providing mentorship and growth opportunities for today's students and teachers to ensure they develop the skills they need to become the STEM leaders of tomorrow. STEM Partners addresses both of these statistics head on by introducing a STEM-skilled professional volunteer to students in the classroom. Over the course of the year, students have a chance to learn about the day-to-day life of their STEM Partner, dispelling the mystery of what STEM professionals do each day!